This is where it all began. The idea of forming a club originally came as the result of the race organizers requesting our assistance. That was in 1999, and we have continued annually since then. The event happens on Earth Day each year, and consists of cycling, paddling, running and navigating. For more information about the race itself visit Fort Whyte Alive. Eco-Adventure is a great test of both our preparedness and ability to operate "off grid". There are approx 10 amateurs involved over a two day period. Saturday our command post, and portable repeater/tower get setup at Fort Whyte Centre. 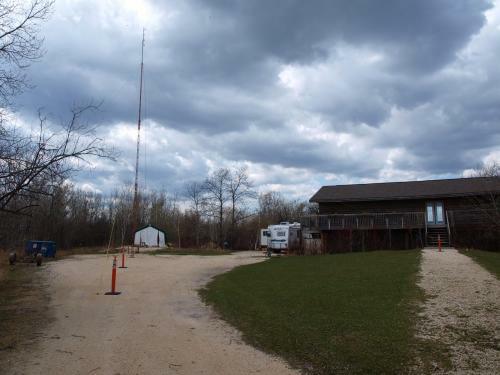 It's quite a logistical feat to get the 60 foot crank-up tower in place and guyed correctly. With no commercial power source available, we run on generator power throughout the week-end. 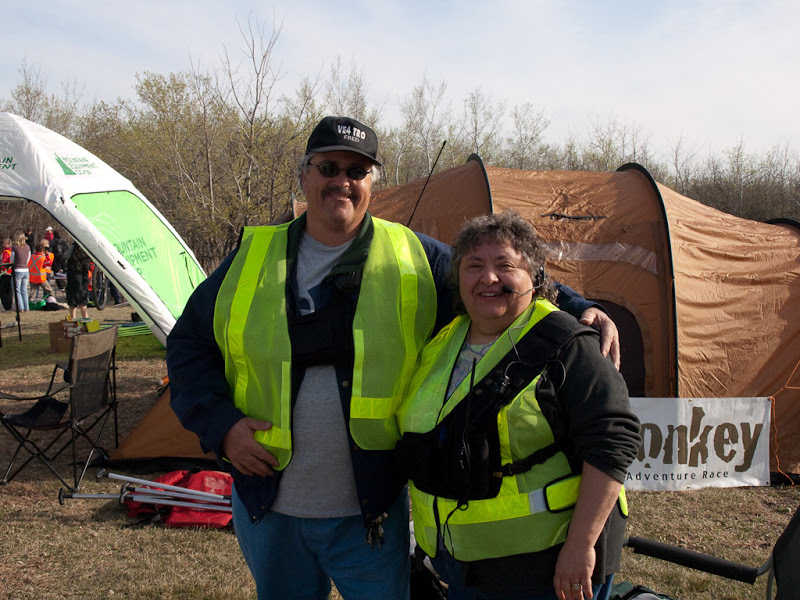 The event itself starts early on Sunday, and requires our volunteers to be at their post and "on the air" by 0800hrs. Our primary objective is to provide reliable communications between event organizers, checkpoints, and other key individuals throughout the course. We utilize our portable UHF repeater and 60 foot portable tower to provide HT portable coverage throughout the city and race course. Our recent upgrade to a 4 bay dipole has increased our coverage and provided a more robust solution....even with 10 watts from the transmitter. The day is usually a very long one, since we meet at 5:30am to start raising the tower and getting the repeater operational. Operators need to be at their station for 8:00am, while the race is usually finished about 1:00pm. Of course we have to lower the tower and pack everything away after the race, so the day isn't over yet. 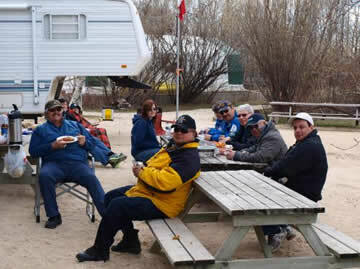 To finish off the day on a relaxing note, we usually have a BBQ of hot dogs, chips, potato salad and some other treats. It makes a great way to end the day! We have made an effort to take pictures from as many events as possible. Please feel free to browse through out photo galleries from previous Eco-Adventure Races.